Spektakuläre Wohnung mit großer Terrasse und Panoramablick. Apartment direkt am Strand mit 2 Schlafzimmern und 2 Bädern. Pool com. Enjoyed the visit, would recommend unit highly. Great team to ensure you have a quality experience. Beautiful apartment, clean, everything provided. Spectacular views of the ocean. Tres bien situé entre Gibraltar et Marbella. L'appartement est complet, tout le confort est présent. La terrasse est exceptionnelle. Très très bien. Thanks for your comment Mr Gerbet. We are glad you enjoyed your stay in our apartment. Hope to see you again soon. Spacious, clean and comfortable. 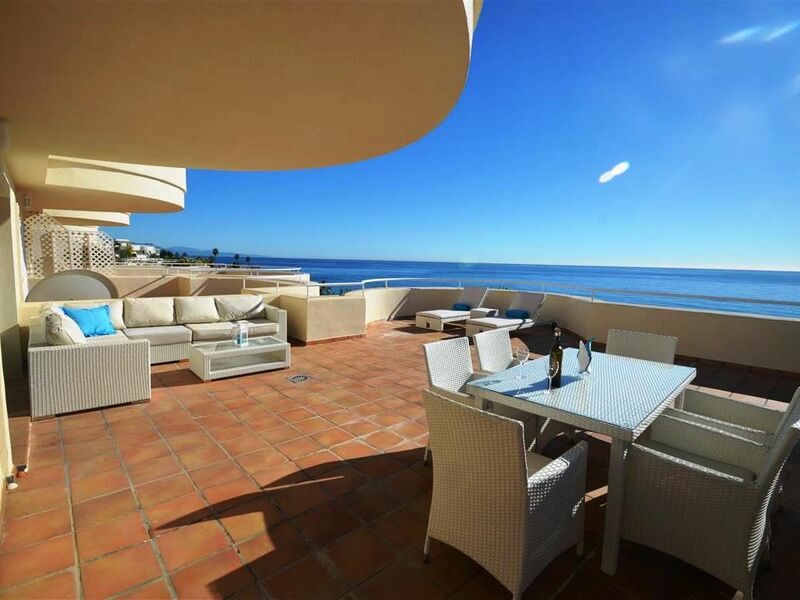 With a fantastic terrace and view of the beach and sea. Every facility we needed. With a pleasant welcome from Irma. When we were planning our family holiday we were looking for a peaceful place to enjoy our precious time. This lovely Bermuda beach apartment with the most amazing view and comfort just exceeded all our expectation. We had to use of two spacious bedrooms with their own bathrooms. The kitchen was fully equipped and seating and dining area was tastefully furnished. The best of all was a large terrace with low corner sofa set, two loungers and another dining set for 6 persons. The property was spot-on clean, smelled lovely and overall well-maintained. As we are family with two little girls the property owner Maria was such kind and made sure there is a sandpit-kit and parasols to use. There is a lovely sand beach just in front of the property and private swimming pool to use. There is plenty of nice places to go to, there is a aqua park near by but we most enjoyed just the night ice creams feasts in Estepona. It is worthy to visit the local markets (we have been to the Sunday one in Estepona). I did already recommend this property to our friend and we will definitely come next May back again.